Next in this series of books – a good look at different layouts for graphic design. 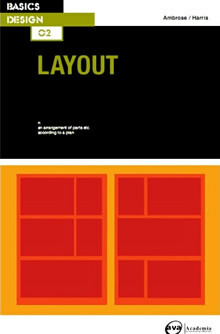 A print-based book, it looks into the technical terms and explanations of layout within design. There are plenty of diagrams, drawings and photos to illustrate the techniques and to provide creative inspiration. A good book for learning more about graphic design and layout, and for inspiration for print based design work. Fantastic as a reference book to dip in and out of for inspiration for projects, or for reading from cover to cover to improve your skills and knowledge. This series is very good, I would highly recommend them for students as a very interesting set of reference books, I remember using these a great deal during my degree.